We welcome all who come into our midst, from seekers of a faith community to the spiritually dispossessed. We spread the joy of faith by sharing our many gifts among the people of our church and our community, and by dedicating our time, talent, and treasure to the sick, the poor, the forgotten, the least among us. Our church is a place of healing and comfort, a people who fast become family and community. Our purpose is to lift all closer to God through a liturgy that has endured through the ages, grace-filled sermons, sacred music, communion at the table of our risen Lord, beauty that celebrates and honors God, and the practice of loving our neighbors as ourselves. Regardless of your denominational membership, all are invited to receive communion at our table. THE EPISCOPAL CHURCH in the United States of America is part of the worldwide Anglican Communion which has approximately 70 million members. We claim to be both catholic — that is, true to the historic and apostolic faith, and protestant — as well as truly reformed and evangelical. The only required confession of faith is the Apostles&apos; Creed (which is our baptismal creed) and Nicene Creed which we share with all of Christendom. Our profession of faith is in Holy Baptism, and our central act of worship is the Holy Eucharist, also known as Holy Communion. These are the two great Sacraments of the Church, given by Christ as a sure and certain means by which we receive his grace. The Apostle’s Creed is the ancient creed of Baptism; it is used in the Church&apos;s daily worship to recall our Baptismal Covenant. Since we belong to the historic and apostolic faith, we embrace the other sacramental rites of the Church. They are confirmation, ordination, holy matrimony, reconciliation of a penitent, and unction. Because we are a global church, we cannot be parochial or isolationist. Our unity of worship allows for variations which serve to remind us of the universal nature of the Church. Thus, we celebrate our diversity, and tolerance is viewed not as an excuse or a sign of weakness, but as our strength. THE LITURGY of the Church is expressed as the “act of the people” in a worshiping community. We worship in accordance with the Book of Common Prayer (BCP) and sing hymns from three different hymnals authorized by the Standing Liturgical Commission. 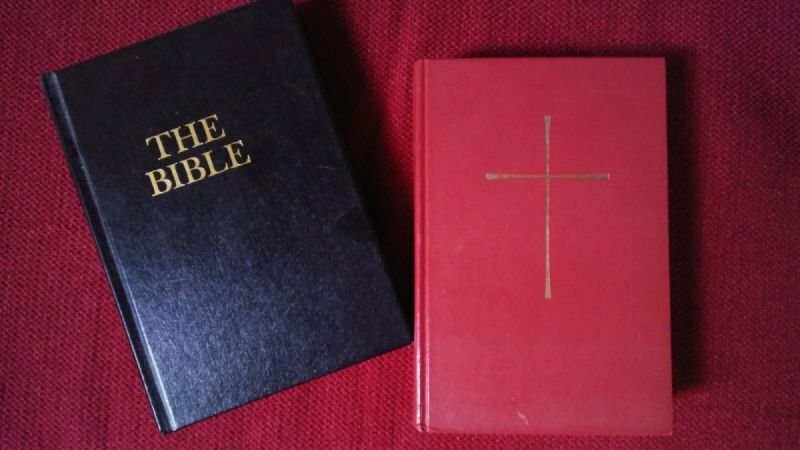 Both the Book of Common Prayer and the hymnals are set forward by authority of the General Convention of the Episcopal Church. At our services you will find Bibles, prayer books and hymnals in the pews. If you are unfamiliar with our services, you will find these helpful in following along with the service, along with the printed bulletin which is provided by an usher, or may be picked up at the front or back of the church. The Hymnal numbers are announced and posted on the board at the front of the church. IN OUR WORSHIP, we are united with past, present, and future generations of Christians. Our worship experience is carried out with a view to the glorification of God, not for our entertainment. Thus, Episcopalians are not spectators but participants in worship. Not only do we express ourselves in word but also in gesture. Generally we kneel to pray, we stand to praise, and sit to be instructed. All other devotional gestures are optional and purely personal. Please feel free to do what feels comfortable for you in our service. For Episcopalians, worship is the most important thing we do, and ultimately this reality should characterize all that we do in every area of our life. WE BELIEVE that God is knowable . . . and that we are loved. We believe that you can know, experience and have a relationship with God. We believe that all of creation is good. God created each element of his creation and said, “It is good.” Jesus said, “the Kingdom of God is in your midst.” We can be a part of it now. Therefore we embrace all of life and believe life is to be celebrated. We also refuse to divide the world into the physical and the spiritual. We believe that God is in all that we do and that living a spiritual life is a 24 - 7 affair. Salvation is not a merit badge to be earned but a process -- a journey to be lived. We are never in a position of not being loved by God. When we come together to worship, we come together to celebrate that love, not to get something that is absent to us. The problem humanity faces is not the Lord’s presence to us, but rather our presence to God. This is what any sacramental celebration tries to overcome -- not God’s distance from us, because there is none, but rather our distance from God and our unawareness of the love that is already there for us. WE ARE IDEALISTS. We take words like peacemaker, mercy, grace, equality, and so forth seriously. We strive to incarnate those words into this universe. We believe in living into the ideals of Jesus and forgiving ourselves and others when we fail to do so. We are content to LIVE WITH QUESTIONS. Ours is a “seeker-friendly” church where we believe God will meet us wherever we are on our spiritual journey. We do not believe that we have to have an answer for everything. We have an intense respect for thoughtful holiness. We resist giving people simple answers to complex questions. We do not see ourselves in opposition to any field of inquiry, but in concert with it. We are a people of COMMON PRAYER. The spiritual journey is a communal activity. When we ask a person to walk the way of Jesus, we are asking her or him to do so in the company of fellow travelers. The people of God who we call the Church are here to strengthen and encourage one another in our spiritual life. We do this when we come together for our common act of worship and learning. We do this when we care for one another in both the good times and the bad with our ministries of presence, prayer, and kindness. We do this when we work together to alleviate the suffering of those who are oppressed in mind, body, or spirit. And we do this when we invite others to join us on our journey. When we come together as the Church in large or small groups, we are strengthened and encouraged by God and by one another. 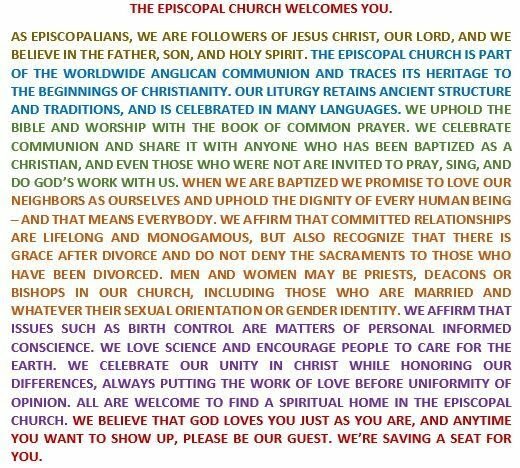 THE EPISCOPAL CHURCH is an inclusive church that resists classifying or categorizing the people of God. Join us on this shared journey we know as faith.